​Design Repurposing, Verification, Manufacturing Prep, and Manufacturing. Overdrive (TM) is a unified 3D modeling kernel developed by CAD visionary Mark Vorwaller of VX Software and industrialized by ZWSoft. Unlike traditional modelers, Overdrive unifies solids, surfaces, and direct-edit modeling into a single modeler enabling flexible, interoperable design. 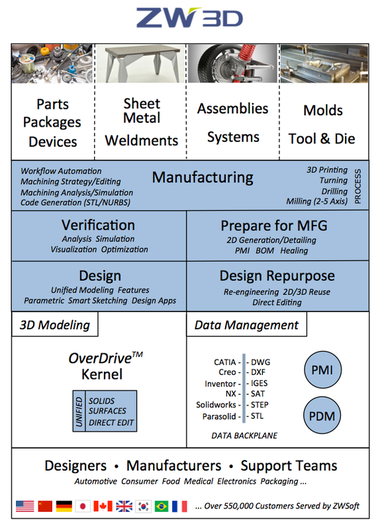 Overdrive meets or exceeds the abilities of high-priced modelers and, as a unified kernel, enables powerful new features, applications, and benefits across 3D CAD/CAM not possible in other solutions. With the flexibility to choose and combine solids, surfaces, and direct-editing techniques, designers are free to select the best approaches and realize shapes and products simply not possible before. Additional design tools and applications include parametric modeling, feature-based design, 3D smart-sketching tools, spec-driven optimization, a full verification suite, and design applications for assembly, mold, sheet-metal, and weldments. For manufacturing, ZW3D's total solution extends to part healing, 2D & BOM generation, CAM automation, machining sequencing & analysis tools, and CNC code generation (STL/NURBS) for turning, drilling & milling (2-5 axis) machines. 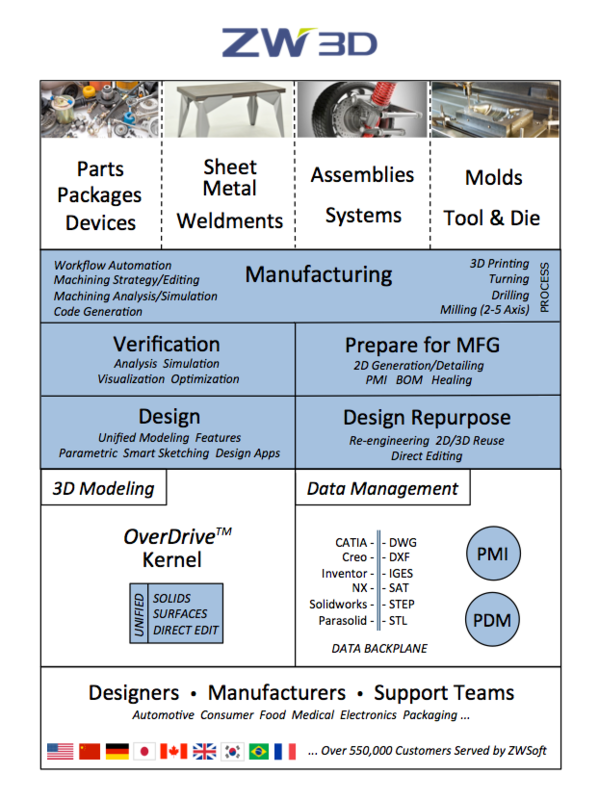 All manufacturers can now be fully 3D-enabled and empowered to realize compelling and sustaining business benefits. Suppliers and shops can speed delivery times, enhance customer collaboration, advance their manufacturing portfolios, increase quality and yield, improve productivity, streamline their processes, and take full advantage of the latest machine technologies and features. 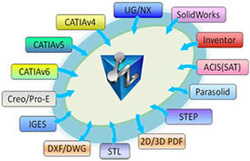 ZW3D's read/write data backplane supports the formats of all popular CAD/CAM tools, machines, and industry standards, including CATIA, Creo, Inventor, NX, Solidworks, Parasolid as well as DWG, DXF, IGES, SAT, STEP, and STL. With prices starting at $1300 (US), ZW3D solutions are available for less than half the price of traditional, high-end 3D CAD or 3D CAD/CAM systems. 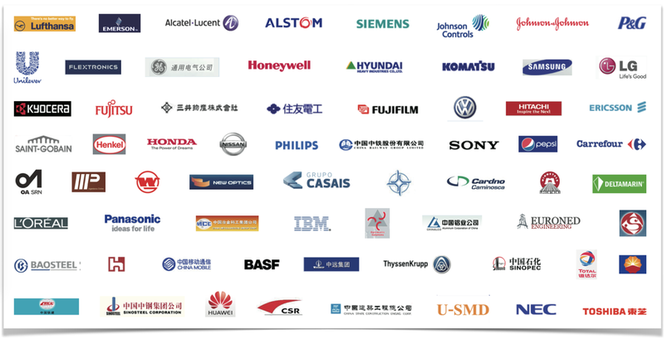 ZWSoft serves over 550,000 users around the world. ZW3D is backed by a world-class support organization and rich, online tutorials to ensure confidence and success. ZW3D is used for mechanical part/tool, plastic product/system, and small/large assembly design, manufacturing, and support across a range of industries including automotive, consumer, food, medical, electronic, and packaging. ... “We were inspired by the unlimited possibilities of ZW3D's freeform surfacing and filleting. Now the Freeride system is but one part of our product palette, which is developed exclusively using ZW3D." ... the pleasant surprise of showing what a full-featured CAD/CAM system can do for you.